The Riviera was named after the coastal towns of France and Italy, because of its striking resemblance. The front or ocean side of the Riviera extends from Mission Street, at the Mission to North Salinas Street. The upper and lower Riviera share the same upfront, breath taking, ocean views, and the backside has stunning mountain view and some ocean views. The backside of the Riviera extends from the north side of Foothill Road to Sycamore Canyon. 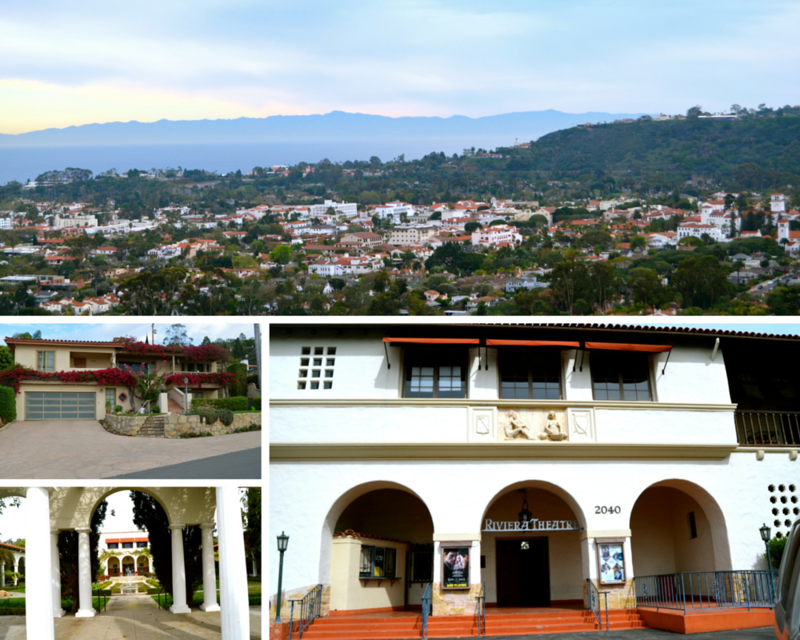 One of the most famous scenic drives in Santa Barbara is Alameda Padre Serra, (APS), named after the Mission Padres. APS divides the upper and lower Riviera and winds across the front side of the Riviera, offering some of the most stunning ocean views in Santa Barbara. The Riviera Theater, located on APS in what was the auditorium of the former Riviera campus of Santa Barbara College of the University of California. The interior of the Riviera Theater looks like a typical mission style school auditorium, built in the early part of the century. There are gabled-beamed ceilings, and lantern wall sconces with stained glass. Across the street from the Riviera Theater is the El Encanto Hotel. Originally built to house students, in 1917 it was developed as a cottage hotel with anticipation of the growing tourism market. The hotel has changed hands many times and through the years has kept its quaint cottage style feeling, with a beautiful French Country look and gorgeous ocean views. The most recent transformation has added many luxurious amenities. Many of the streets are lined with stonework from the 20th century Italian immigrants. The Riviera architecture consists of a mixture of architectural styles: California Cottages, Spanish Colonial Revival, Mediterranean Revival and Contemporary wood and glass homes.